OREGON – New data from the U.S. Department of Commerce reveals that despite an uncertain U.S. trade environment, Oregon exports continue to grow. In 2018, the state exported $22.3 billion in goods to countries around the world—a 1.8 percent increase from 2017. Oregon remains an important global trade partner on the West Coast, especially to countries across the Pacific Ocean. Five of Oregon’s six top export countries—receiving at least $1 billion in Oregon exports—are in Asia: China, Japan, South Korea, Malaysia, and Vietnam. The second-largest trade partner in 2018 was Canada. 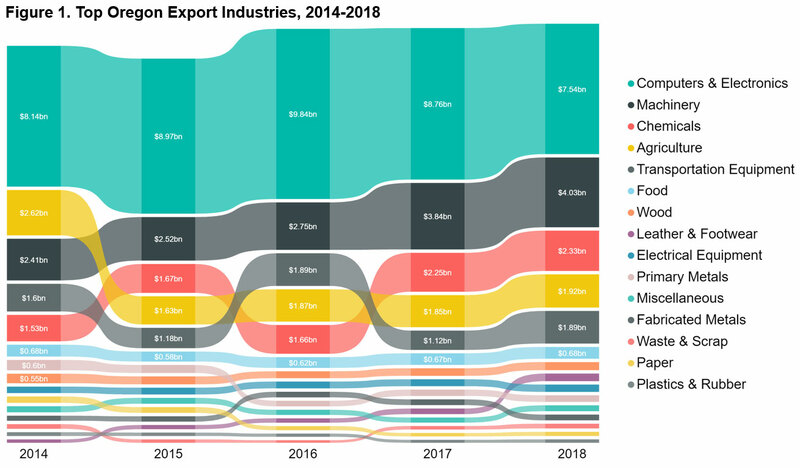 Top exports last year included computers and electronics, machinery, chemicals, agriculture, and transportation equipment (Figure 1). While trade tensions remain between the United States and Oregon’s top trading partners, China and Canada, Oregon exports to both countries increased the most of any international partner in 2018 over the previous year. China received $4.7 billion in Oregon exports, a 20 percent jump from the previous year. Only about one-third of Oregon exports to China are subject to proposed or enacted tariff increases, with electrical and industrial machinery—items not subject to tariffs—seeing some of the largest gains in trade. Exports to Canada, which totaled $3.2 billion in 2018, saw more than 35 percent growth from 2017, rebounding in the past 18 months due to heavy manufacturing exports. Machinery, transportation equipment, and metals have historically accounted for half of all exports to Canada—a good sign for the state, as transportation equipment exports experienced a 69 percent increase last year. “It’s great news for Oregon’s economy that exports continue to grow. Last year’s gains are especially welcoming given the current global environment where the strong U.S. dollar, slower international growth, and increased trade tensions all work against U.S. exports,” said Josh Lehner, senior economist with the Oregon Office of Economic Analysis. Oregon exports remained stable in 2018 in part because of the strong relationships the state and its partners have built with countries over the years. The Port saw robust two-way trade activity in recent years—from exports of commercial trucks to Australia, to imports of wind turbine parts that help power the state. The Port ships goods via its four marine terminals and through an air international cargo partnership with Cathay Pacific. Another industry vital to regional prosperity is agriculture. After experiencing a dip in 2015, exports of agricultural goods—from hay to hazelnuts to wheat—have been steady in recent years and grew by nearly 4 percent in 2018. Japan’s exports represent a 20 percent jump in 2018, with most of this growth coming from agriculture and aerospace products and parts. Japan is Oregon’s largest food and agricultural export market, followed by Korea, Canada, and China. Oregon’s agriculture products are growing in popularity in emerging markets such as Vietnam, which recently opened its market to fresh blueberries from Oregon. “Food and agricultural exports remain critical in supporting communities across the state. We will continue to prioritize these vital trade relationships and pursue new international markets; our industry and economy depend on it. With 80 percent of Oregon’s food and agriculture production leaving the state and 40 percent leaving the country agriculture’s $98 billion-dollar economic impact is felt in all corners of the state. We are excited to continue our work in building strong trade relationships that allow Oregon’s in demand, high-quality products to show up in markets across Asia, North America, and everywhere in between,” said Alexis Taylor, director of the Oregon Department of Agriculture. Computers and electronics, while still Oregon’s largest export industry accounting for one-third of Oregon’s exports, did see a 14 percent drop from 2017 levels. This impacted export numbers to some countries such as South Korea, Malaysia, and Vietnam. With Oregon’s total export numbers still rising even with this drop in computers and electronics shows the strong benefits of diversification in Oregon’s traded sector industries. Uncertainty remains for trade-dependent states like Oregon. What these trade numbers from 2018 confirm, however, is that state-level connections with trade partners are more vital than ever—and Oregon is setting itself up well for the future because of the long-term relationships the state and its partners have established. The top countries receiving at least $1 billion in Oregon exports were China ($4.7B), Canada ($3.2B), Japan ($2.2B), South Korea ($1.7B), Malaysia ($1.5B), and Vietnam ($1.1B). Transportation equipment exports experienced a 69 percent increase last year, the largest of any industry. Heavy trucks and tractors and aerospace make up most of Oregon’s transportation equipment exports. Heavy trucks and tractors increased exports by $454 million, with most of these exports going to Canada. Semiconductor machinery makes up over half of all machinery exports and has grown significantly over the past five years—seeing the strongest export growth in Europe. Potash, a fertilizer, and pharmaceuticals and medicines are the largest commodities exported in the chemicals industry. These commodities, as well as basic chemicals, have increased chemical exports by 53 percent over the past five years. Potash is mined in Saskatchewan but exported out of Oregon. Computers and electronics make up one-third of the state’s exports, but 2018 marked the second year in a row that exports of computers and electronics were down in Oregon from the previous year. 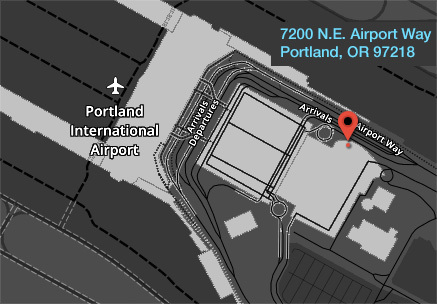 Established in 1891 by the Oregon Legislature, the Port of Portland today owns three airports (Portland International, Hillsboro, and Troutdale), four marine terminals, and five business parks. The Port’s mission is to enhance the region’s economy and quality of life by providing efficient cargo and air passenger access to national and global markets, and by promoting industrial development. Its core values are leadership, inclusion and service. For more than 85 years, the Oregon Department of Agriculture (ODA) has provided service and expertise to those whose livelihoods depend on agriculture. Those services extend to the Oregon consumer. We are committed to our mission of consumer protection and food safety, natural resource protection, and agricultural market development. It is our goal to provide excellent customer service, delivered in a practical, and friendly manner that meets a high standard of professionalism.